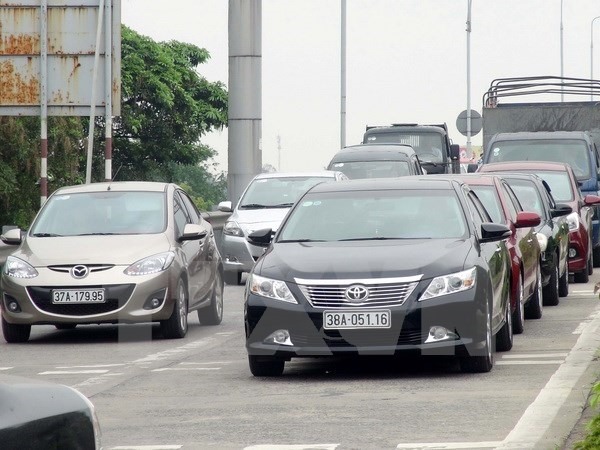 HÀ NỘI — Certain types of vehicles will be exempt from paying tolls at the Bến Thuỷ I toll station connecting the central provinces of Nghệ An and Hà Tĩnh, the Ministry of Transport (MoT) said on Tuesday. Vehicles eligible for the waiver include Type 1 and Type 2 vehicles owned by permanent residents of and organisations or enterprises headquartered in Vinh City, Nghệ An Province’s Hưng Nguyên District, and Hà Tĩnh Province’s Nghi Xuân District and Hồng Lĩnh Town, as well as public buses running through the station. Type 1 vehicles include cars with less than 12 seats and trucks weighing less than two tonnes, the MoT said. Type 2 vehicles include cars with 12-30 seats and trucks weighing from two to four tonnes. The toll charge waiver comes into effect on April 24. The people’s committees of the two provinces are responsible for directing concerned authorities to collaborate with local enterprises to identify the number of vehicles eligible for the waiver before April 20. The decision was made following local citizens’ request to remove both the Bến Thuỷ I and Bến Thuỷ II toll stations on the Bến Thuỷ Bridge on April 9 due to the high toll fee charged by the Build-Operate-Transfer (BOT) investor Civil Engineering Construction No 4 Joint Stock Company (Cienco 4). The company was reportedly collecting tolls from vehicles that were not using the BOT sections. Hundreds of locals from Nghi Xuân District and Vinh City have protested the toll charges by covering their vehicles with banners and driving across the Bến Thủy Bridge. That protest has taken place several times since the end of March. Despite an MoT decision to halve tolls at the two toll stations on April 3, protesters continued by using banknotes of less than VNĐ1,000 (US$0.04) to pay tolls, causing severe congestion and delays on the bridge. Hundreds of drivers gathered at the two stations on the morning of April 9 to sign a complaint to be "sent to the Government and National Assembly," requesting the authority’s "intervention" regarding the high tolls, the Dân Trí online newspaper reported. The MoT on Monday requested the Việt Nam Express Corporation (VEC) to remove the Đại Xuân toll station on the Pháp Vân-Ninh Bình Highway before April 30. The request was made based on a report from VEC which shows that some 150 traffic jams have occurred within 3km from the station since 2011. Traffic congestion got worse in 2015 on both lanes of the highway when the BOT Pháp Vân-Cầu Giẽ Joint Stock Company joined the VEC in collecting toll fees. Around 70 traffic jams were recorded in 2015 and the first half of 2016, according to the report. Two toll stations are unnecessary on a highway that is only 100km long, Mai Tuấn Anh, general director of VEC, said. The Đại Xuyên toll station was installed at Km212+35 on the Cầu Giẽ-Ninh Bình Highway, connecting the highway with the Pháp Vân-Cầu Giẽ Highway. It collects toll fees on 15 lanes, six of which lead vehicles into the Pháp Vân-Cầu Giẽ Highway and the remaining nine lead them out of it.